Blogger Valerie Hurst wrote today's guest post. She is an account executive for Skyline Exhibits. Tradeshow exhibitors, how many times have your show services been estimated—and all costs seem to be under control—when you receive the post-show service invoice, and the drayage costs shock you and throws you over your budget? 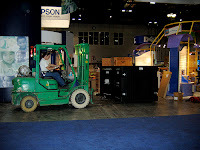 The official definition of drayage (aka, "material handling") is "the unloading of your exhibit properties; storing up to 30 days in advance of the show at a warehouse; delivering properties to the booth; the handling of empty containers to and from storage; and removing of material from the booth for reloading onto outbound carriers" (source: Freeman). Consolidate shipments under 200 pounds into one shipment. There is always a minimum drayage charge for every shipment delivered to the warehouse or show site. By consolidating shipments, your charges will be based on the total shipment weight, instead of individual minimum charges. Plus, by consolidating shipments, your properties will stay together and have less chance of being misplaced! Know the material handling rates. Sometimes it is less expensive to ship to the warehouse, while other times it is more cost effective to ship direct to the show site. Some shows now include the cost of drayage with booth space, but usually require you to ship direct to the show site. Do your homework: review the show kit, compare freight costs and the timing of the arrival of freight, and decide what makes sense for your booth space. Know the target dates to avoid overtime charges. Every warehouse accepts freight between certain hours and for each show there is a warehouse deadline. If you miss this deadline, overtime charges are often 25 percent more than the standard rates. Consider shipping direct to show site if you can; or, if your shipment is small, ship to your hotel and hand-carry your items into the show. Again, the information you need is in the show kit. Understand what is considered "special handling". Did you know that if carpet and padding are shipped with your crated exhibit properties, that special handling charges often apply? Did you know that, if a truck requires ground unloading, or if you ship via FedEx, UPS, Airborne or DHL, these shipments are also charged at a higher rate? Understand the general contractor's definition of special handling and work with your traffic manager to ship your items, properly labeled, in the right size truck, and not mixed with loose items. Is your move-In or move-out target date on an overtime day? Many shows have targeted move-in and move-out dates. Perhaps your booth is scheduled to move out on a Saturday, even though the show ends at 2 pm on Friday. Review the show kit to find the person you can contact to request to have this date changed. Many times this will be allowed, but of course it depends on the size of your booth and where you are located on the show floor. It does not hurt to inquire, as it could save you money. Photo courtesy of Tim Wilson.